Dogs and cats can learn to be friends. Books and movies tell us that cats and dogs are mortal enemies, but the truth is dogs and cats can peacefully -- and even happily -- coexist. Training your dog to accept a cat works best when done before the dog has shown aggression toward cats. The best way to stop aggression is to prevent it in the first place. Puppies are unlikely to hurt cats because puppies are so small. They are also much more open to new experiences during the first 16 weeks of life. Socialize your puppy to cats by exposing her to cats regularly and giving her a treat each time she encounters a cat. This teaches her to associate cats with positive feelings and rewards. Dogs who are already aggressive to cats can be difficult to train. 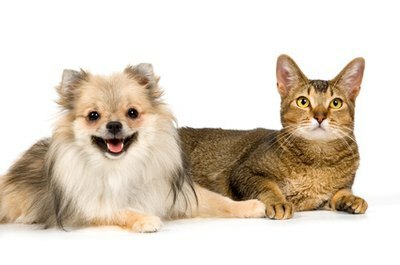 If you have a cat and a dog, it may be wise to recruit a dog trainer to help you. If you want to do it yourself, however, start by establishing how close the cat can get to the dog without provoking an aggressive reaction. Then add one foot to that distance and put the cat that distance away. Click a training clicker and give your dog a treat. Repeat several times each day for a week. Then decrease the distance by one foot for every week thereafter until your dog is no longer reacting aggressively to the cat. If your dog is aggressive toward your cat, odds are good that your dog is not the only culprit. Dogs and cats frequently have trouble understanding one another's body language, and cats may harass dogs when their owners aren't looking. Keep the two animals completely separate during the training period to ensure the cat has no opportunities to harass the dog and the dog has no opportunities to injure the cat. Although dogs can be trained out of aggression, a dog who has shown aggression to cats should never be fully trusted. Provide your cat with a safe, elevated location away from the dog so he can easily escape in case of an emergency. Don't force your dog and cat to play together, and carefully monitor all interactions for signs of aggression. Can Cats Have Broken Hearts?